The number of Democrats lining up to try to take on President Donald Trump as he seeks re-election is growing by the week. So who's running and what are their strengths and weaknesses? This field of candidates promises to be the most diverse yet. It already has the most women running in US history. The BBC's Anthony Zurcher casts his eye over them. Anthony's take: He's the top Democrat on the House Intelligence Committee and was previously on the Homeland Security Committee, so has travelled to countries like Pakistan and Afghanistan. At 38, he's one of the younger candidates to enter the 2020 Democratic presidential race. He's not positioning himself as the voice of his generation, however, and is instead making gun-control a central theme of his campaign. That's an issue that resonates with Democrats and yet has been on the periphery for most of his presidential rivals. Media captionDemocrat Congressman Eric Swalwell: "It's a momentous day"
Swalwell has also been an outspoken critic of the president's and a fixture on cable news shows. Donald Trump's rise is evidence of the fact that a robust television presence can translate into voter support. Anthony's take: He unsuccessfully challenged Nancy Pelosi for the top Democratic leadership spot in the House of Representatives in 2016, urging his colleagues to embrace a new generation that better reflects the party's priorities. Now he has his eyes on a different prize, counting on Democrats to appreciate his appeal to the disaffected voters in the Midwest who voted for Barack Obama in 2012 but not for Hillary Clinton in 2016. He touts trade and jobs as his big issues, but he's moved to the left on social issues, as well. Primary voters in 2020 will have to make a decision about whether to try to win the last war by recapturing Midwest blue-collar voters or fight a new one by assembling a different kind of electoral majority. If they choose the former, Mr Ryan may have an outside chance at taking the prize. Anthony's take: He will tout his personal story, as the child of Jamaican immigrants, more than his relatively thin political record in hopes that it catches the eye of Democratic voters. If there is a path to the nomination for Mr Messam, it runs through South Carolina, which holds its primary shortly after Iowa and New Hampshire. If the mayor can form a bond with the Democratic voters there, a majority of whom are black, he might be able to carve out a bit of the spotlight and use it to boost his prospects in contests throughout the south. Anthony's take: There's something strange about an electoral defeat launching a presidential campaign. But 2020 is shaping up to be a strange election cycle. Beto O'Rourke captured the imagination of Democrats across America with his energetic, yet ultimately unsuccessful, 2018 bid to unseat Republican Senator Ted Cruz in Texas. He became a social media star, packed rallies across the state and posted fundraising numbers more akin to a presidential contender than a Senate hopeful. Now he is a presidential contender. The former congressman from El Paso enters a crowded presidential field, but few of his competitors have matched Mr O'Rourke's star power. Bernie Sanders has his passionate devotees. Kamala Harris pulled 20,000 to her campaign kickoff in Oakland. But Mr O'Rourke has the potential to match them cheer for cheer. Sensible journalists swoon. "Beto" attire has been spotted in Brooklyn coffee shops and on the head of basketball star Lebron James. Despite a paper-thin resume, Mr O'Rourke is a rare political phenomenon. The late Texas writer Molly Ivins once observed that a successful presidential candidate has to have "a little Elvis in him". Mr O'Rourke has Elvis in spades. Enough Elvis to open a Las Vegas casino. Now Elvis is going on tour. Anthony's take: John Hickenlooper's presidential pitch to Democrats is simple. He's a practical businessman-turned-politician who has shown he can successfully enact progressive policies in a moderate state. He points to his recently concluded two terms as governor of Colorado, where he presided over new environmental regulations (although he maintained his ties to the energy industry), the expansion of health care coverage (although he opposed a universal coverage proposal) and new gun-control laws (although his support was initially tepid). In a field where many candidates are offering shoot-for-the-moon agendas, Mr Hickenlooper embraces politics as the art of the possible, noting that his success in Colorado came through good-faith negotiations and bipartisan compromise. It's not an unheard-of strategy. George W Bush rode a-uniter-not-a-divider rhetoric to the White House in 2000. Barack Obama first captured the national spotlight in 2004, when he denounced a red state/blue state us-against-them outlook. That may be a tougher sell this time around, however. Mr Hickenlooper will start toward the back of the pack, where only the loudest voices break through. He's the second governor to enter the race, but Jay Inslee - who announced last week - is counting on his laser-like focus on climate change to distinguish his candidacy. Mr Hickenlooper is taking a broader approach, pitching himself to the majority of Democrats who say their top priority is someone who can beat Donald Trump. The low-key, affable former brewpub-owner might be able to do that - but he's got an uphill climb if he wants to get the chance. Anthony's take: Jay Inslee is someone who in the past would be a naturally formidable presidential candidate. He's a veteran politician with the kind of executive experience that comes from being a governor of a mid-sized state. At a small session at the liberal Netroots Nation conference last August, the 68-year-old Inslee displayed a low-key confidence and command of the issues, with the kind of self-deprecating wit that can be effective disarming critics. He won't light up a stage like Senator Cory Booker or potential candidate Beto O'Rourke, but he's a comfortable public speaker. This isn't your father's Democratic Party, of course, and with a diverse range of candidates already in the race, Mr Inslee will be pressed to find breathing room for his campaign. His answer is to fashion himself as the environmental candidate. With the Green New Deal getting traction among progressives, Mr Inslee is touting his work addressing climate change in Washington state. He's launching his presidential bid at a solar panel factory whose success he attributes to his policies as governor. If Mr Inslee gets the attention of Democratic voters with his environmental pitch, he can then pivot to talking about his efforts to fight the Trump administration's immigration policies, expand healthcare in his state, raise the minimum wage, enact paid family medical leave, end capital punishment and pardon Washington residents previously convicted of now-legalised marijuana drug offences. It's a record of progressive accomplishment that the half-dozen senators already in the race, having toiled in the minority since 2014, can't match. Anthony's take: After building a grass-roots political movement that roiled the Democratic Party in 2016, Bernie Sanders is making another run at the prize. In 2016, the self-proclaimed "Democratic socialist" staked out a progressive agenda in contrast with Ms Clinton's pragmatic centrism. Now, in part because of Mr Sanders' efforts, the party has moved left on issues like healthcare, education and income inequality. His message is no longer unique. The 77-year-old senator will keep his devoted base, but will some former supporters opt for a fresh face? That could lead to conflict with those who believe a Bernie "revolution" is the only way forward, inflaming Democratic wounds not fully healed from the last campaign. Anthony's take: Amy Klobuchar may not be a household name, but the senator cruised to 2018 re-election in Midwestern-ish Minnesota. Another former prosecutor, she came off as coolly competent in the heated Brett Kavanaugh confirmation hearings. Anthony's take: We've reached the point in the presidential pool party where candidates are no longer dipping their toes in the water, they're shouting "cannonball" and hurling themselves in. Cory Booker has rolled out an inspirational-style video and will be hitting the road in Iowa and South Carolina, starting what he hopes is the long road to the Democratic nomination. If the presidential race were a declamation contest, Mr Booker would head the pack. And even though it's not, he still has a number of advantages. His proximity to New York has made him a prodigious fund-raiser. His background reflects the diversity of the modern Democratic Party. His time as mayor of blue-collar Newark gives him a grounding to the plight of the underprivileged. Many on the left don't trust him, however. They view his big-money ties as a liability and haven't forgotten his 2012 defence of Republican Mitt Romney's venture-capital background. In a crowded field, Mr Booker will be pressed to convince Democratic voters he's the one to take them to the promised land. His silver tongue will get quite a workout. Anthony's take: Kamala Harris is the kind of Democrat who could stick around and prevail in what is sure to be a gruelling nomination battle. She is from California, which is rich in both primary delegates and fundraising dollars. As a woman, and from an ethnic minority, she is well positioned to capitalise on her party's growing diversity. Ms Harris has only been on the national stage two years, and not every political neophyte can hold up under fire the way Mr Obama did in 2008. She will be tested in the coming months, but she starts the contest near the head of the pack. Anthony's take: Elizabeth Warren has been a favourite of the progressive left since she emerged on the political scene to push for tougher regulation of the financial sector after the 2008 economic crash. During her time in the US Senate she became known for her hard-nosed interrogations of Wall Street executives and as an outspoken critic of income inequality. That loyal base may be enough to rise to the top of a fractured Democratic presidential field - particularly if Vermont Senator Bernie Sanders, the other progressive star of the Senate, decides not to run. The challenge for Ms Warren will be expanding her appeal beyond the already converted. She's an academic by training, having spent much of her adult career as a professor. Her campaign, however, is already emphasising her working-class upbringing over her educational pedigree, as a means of connecting her personal story to the activist government policies she supports. 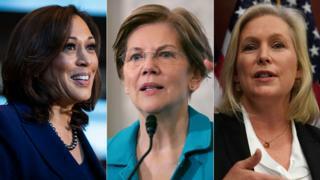 Ms Warren will face the challenge of having to define her candidacy while taking fire from Donald Trump, who has repeatedly disparaged her past claims of native American heritage. Although she hardly mentions the president in speeches these days, she'll have to convince Democrats she won't be only the latest politician the president has belittled - and then defeated. Can Elizabeth Warren go all the way? Anthony's take: Announcing a presidential campaign on the Stephen Colbert Show may end up a cliché by the time the year is over, but credit Kirsten Gillibrand with being one of the first to try it. The New York senator's decision to (almost) throw her hat into the ring isn't a huge shock. She's long been positioning herself as one of the candidates most likely to capitalise on the #MeToo movement, and her pitch as someone who will "fight as hard for other people's kids as she would for her own" just might resonate. Her steady march to 2020 hit a few bumps along the way, though. She angered some Democrats by quickly calling for Senator Al Franken's resignation after he faced sexual harassment charges. And she alienated Clinton loyalists by criticising Bill Clinton's handling of the Monica Lewinsky scandal. As a New Yorker, however, she can tap into a deep vein of campaign cash. She's young and charismatic. If she catches the wave of women voters that powered Democrats to victory last year, it just might carry her to the nomination. Anthony's take: It wasn't long ago that Julian Castro would have been considered a top-tier candidate for the Democratic presidential nomination. He was a well-regarded mayor of San Antonio, landed the keynote address at the 2012 Democratic National Convention and went on to a Cabinet position in the Obama administration. Now, however, he may not even end up the most popular Texan in the race, if former congressman (and Democratic heartthrob) Beto O'Rourke decides to run. And there are other politicians - ones currently holding elective office or, like former Vice-President Joe Biden, with instant name recognition - who are generating more presidential buzz. Anthony's take: Tulsi Gabbard, the first Hindu member of the US Congress, is a difficult candidate to characterise. Most of the Hawaii congresswoman's views fit firmly in the Democratic Party's progressive camp. She was an early and outspoken supporter of Bernie Sanders' 2016 presidential campaign and has been an advocate of universal government-provided healthcare, raising the minimum wage and an anti-interventionist foreign policy. The Iraq War veteran has drawn criticism, however, for meeting with Bashar al-Assad in January 2017 - after the Syrian president had been accused of repeatedly using poison gas on civilian populations. The daughter of a socially conservative politician and activist, Ms Gabbard may also draw the ire of Democratic voters for her past criticism of "homosexual extremists" and opposition to abortion rights and gay marriage. She's also opposed the Iran nuclear deal and condemned "Islamic extremism" in language more reminiscent of a Republican candidate. If Democrats are looking for a young, charismatic iconoclast - even if it means supporting someone whose views don't always match their own - then Ms Gabbard might have a shot. As Republicans will attest, stranger things have happened. Who will lead the left? Anthony's take: Most stories published about Pete Buttigieg prominently mention that he is a Millennial - a member of the generation born between 1981 and 1996. That isn't by accident. The South Bend, Indiana, mayor isn't the only Millennial in the 2020 race - Hawaii Congresswoman Tulsi Gabbard is also 37 - but Mr Buttigieg is positioning himself as a voice for the young. As he notes, his generation came of age in the aftermath of 9/11, were the ones who fought in subsequent US wars and struggled to establish a financial foothold amidst the wreckage of the 2008 economic collapse. Where their aging parents, the postwar Baby Boomers, may not be as concerned about long-term impact of US policies, Mr Buttigieg says Millennials will have to deal with the fallout from today's crises for decades. Mr Buttigieg enters the race with a unique resume. He's an openly gay veteran of the Afghanistan War and a Rhode Scholar. As mid-western mayor, he's shown he has voter appeal in a region that helped deliver the presidency to Donald Trump. Who? Son of an electrician, spent six years as congressman in Maryland. Anthony's take: Delaney was officially the first entrant into the 2020 Democratic presidential field when he announced his candidacy in July 2017. The former tech entrepreneur has a platform that focuses on jobs, education and infrastructure and a return to bipartisan co-operation. Anthony's take: Ms Williamson is a best-selling author, charity organiser and spiritual adviser who counts Oprah Winfrey as her most famous follower. If the billionaire former talk-show host doesn't run, Ms Williamson may be hoping some of Oprah's star appeal translates into support for her political quest to "dig deeper into the questions we face as a nation". Anthony's take: A technology entrepreneur who is proposing the US government pay a $1,000-a-month "freedom dividend" to all Americans between the ages of 18 and 64 as a form of universal basic income to cushion against fewer jobs due to increased automation.